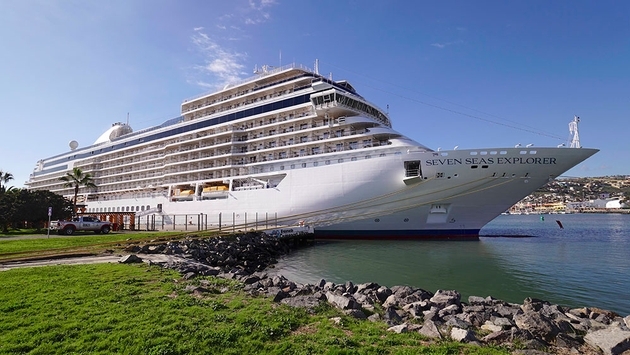 Dedicated to Regent Seven Seas Cruises’ luxurious Seven Seas Explorer, the program was as excellent as broadcast and can thankfully still be watched online via PBS’ official website. Back when Royal Caribbean International introduced the Voyager of the Seas in 1998 as the then largest ship in the world, the aforementioned three-part series looked at its concept and design, building and testing and nature as a city at sea across several hours. “Ultimate Cruise Ship” masterfully crammed just about as much into a single hour. As a graphic designer and videographer myself, I was thrilled with the entire production—with the exception of the cheaply rendered “Ultimate Cruise Ship” introductory title, looking like something from Broderbund’s The Print Shop software. Otherwise, the CGI illustrations were expertly animated throughout. To start, great overhead helicopter passes set the scene, and Frank Del Rio, president and chief executive officer of parent company Norwegian Cruise Line Holdings Limited, introduced Seven Seas Explorer with the goal of making it “the most luxurious ship ever built.” In fact, the documentary provided more insight into those endeavors than even I was privy about via press releases. Of course, as a gear head, I drooled over seeing everything represented in video from the coin ceremony to the welding of the ships’ blocks at the Fincantieri shipyard in Sestri Ponente, Italy. What I was not aware of is that a large 200-foot section was also built at the construction company’s Castellammare di Stabia facility 400 miles away where it had to be towed from taking four days. By doing so, it was able to support a quicker lead time that cut eight weeks off the total schedule. As inefficient as it sounds to build pieces of a singular ship so far apart from each other, it’s actually common practice for Fincantieri. 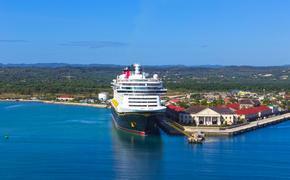 The builder did it for Disney Cruise Line’s Disney Magic, and even Carnival Cruise Line’s upcoming Carnival Horizon, and Viking Cruise Line’s next Viking Sky began their construction at different yards than they will be finished at. In either case, it’s remarkable to see what it took to float the first bit of superstructure by traditionally sliding it into the water with wax and grease for lubrication. Also mind-boggling is that it took Fincantieri only four weeks to initially build Seven Seas Explorer’s 50 plus blocks before hoisting them in place to make up the overall ship form. The documentary additionally notes how the initial segments are first fabricated and outfitted with cabling and plumbing installed in them upside down for easier workability before being craned right side up using a Japanese technique from the 1950s. What stood out to me as new information was simply how much effort the owner and builder put in towards making the ship meet comfort class standards by reducing any ship vibrations to a bare minimum. Many cruise ships feature propellors with four detachable blades. To limit cavitation, the Seven Seas Explorer has six blades cast in bronze together as one giant singular propeller in what no doubt is a seriously costly part, in which there are two onboard by the way. Kudos to the production for referencing the Lusitania’s historic vibrations as something to avoid. Lastly fascinating was the emphasis placed on weight distribution. Luxury ships have heavy marble materials aboard, but ships need to be lighter on top to avoid excessive rolling. To strike a balance, Regent had to make the funnel out of an aluminum alloy, replace glass balcony railings with steel ones and fabricate furnishings with lighter honeycomb structures. While there is not much footage of the completed ship in the program after showing its successful sea trials, it does all lead to a great highlight of the ship’s christening via a 7-gallon bottle of champagne. Of course, to see more you’ll just have to step aboard for yourself.